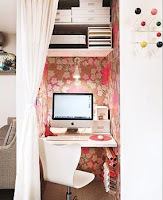 Looking for a way to transform your closet into a home office? 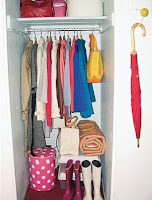 MSN featured this awesome closet remodel by Real Simple design director Ellen Wundrok. She was able to tranform her 32.5" X 42" coat closet into a great office space. Eager to try this out with your own space? Follow these easy tips! Keep the top shelves intact and add some cut plywood for a desktop. Splurge on a fun design element by adding a funky wallpaper. Ellen used a great rosabella wallpaper ($140 a roll, osborneandlittle.com for stores) to brighten up the spot. Combat potential clutter by hiding wires. Computer wires were plugged into a power strip that was attached to the wall beneath the desktop.